Nick Matthes and Ed Stoll of Pieper Electric (who will be installing the PV), flank Rich Hinkelman of Solar Systems Inc (who build the racking for the system). All are MREA supporters and Energy Fair exhibitors! Leaders at Milwaukee Area Technical College kicked off the construction of the largest solar project in the state with a groundbreaking ceremony Wednesday afternoon north of Capitol Drive. 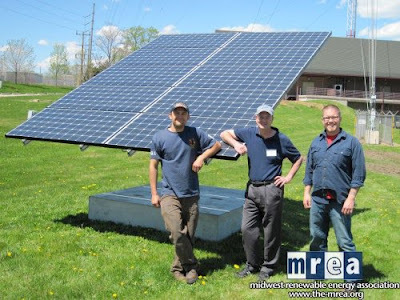 The solar project -- dubbed the Photovoltaic Educational Farm -- will be developed on a former landfill along the Milwaukee River, underneath the television tower for MPTV, Milwaukee Public Television. The project will feature nearly 2,600 solar panels from four different manufacturers, in eight different configurations. It's scheduled to be completed in August. The aim of the project is to showcase a variety of renewable energy technologies, as well as provide training in solar field to students at MATC as well as Milwaukee's three engineering schools, said Brad Bateman of Johnson Controls. "This will be a testing and training platform unlike any other in the country," he said. The project is projected to generate enough power to make the TV transmitter for MPTV the first of any public television station in the country to be powered with renewable energy. MPTV projects energy savings of at least $70,000 in its first year of operation. The project will employ 150 people, said Sargent. Johnson Controls Inc. is the technical college's partner and general contractor on the project, which includes 14 other firms -- 13 of them from Wisconsin. It's about time we start using renewable energy. Big oil has got to go and the sooner the better. How many more disasters do we need to have before the world realizes that we are killing the planet, poisoning our food and water, and causing planet wide catastrophies that will end with us being on the endangered species list.